Why choose MYCARBON fanny packs for women and men? --Running pack allows you to have full use of your hands, more convenient than any purse,and the running belt is a special purse . 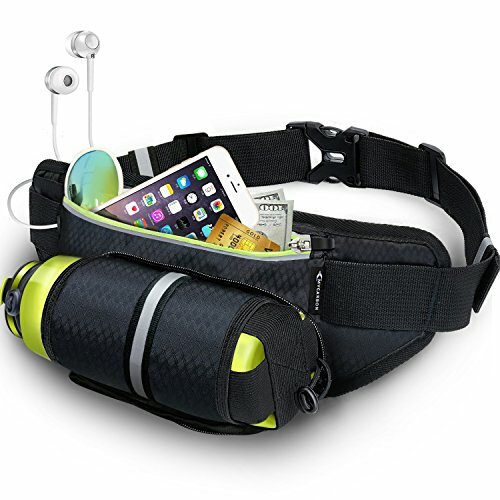 --Unique invisible running fanny pack with water bottle holder allows you to carry the water bottle invisibly and conveniently,you can take out the water bottle from the fanny bag and drink the water while you are thirsty . --An inter layer and a buckle in the main pocket of the waist pack allows you to store in all your iPhone 7/6S Plus, Galaxy S6 S7, Note 6,keys,wallet,ID/business cards & other accessories. --The opening headphone hole in the running pack makes you have the privilege of listening to music when the belt is zipped tight to protect your belongings. Comfortable of MYCARBON running bag? --Relaxing your shoulder, reducing pressure,feeling free water bottle fanny pack. Made in high grade water resistant in the front of the waist bag and breathable net fabric on the back of the fanny pack waterproof. Both will guarantee you great comfort to the running pack belt.? --Adjustable waist pouch also can be a wallet,tool kit,cheese pack and two-way zipper design makes it to be a Multi functional water pack. Our MYCARBON fanny bag is made of high quality waterproof material,and this water bottle pack can protect your objects even when the water drops on the lumbar pack . Generally recommend hand-wash,and please choose the ventilated place to dry the water bottle pack up .Color of the water pack: Black running bag. Color: Black and fluorescent green running belt waist pack.